Delhi and its many tourist attraction are certainly packed with an interesting experience for every traveller. Looking in one certain direction of this city that is East Delhi, this part is blessed with lakes, parks, shrines and places to shop. 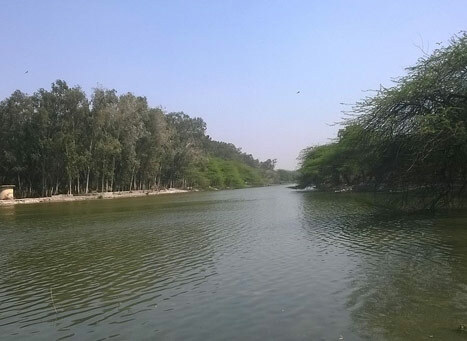 Sanjay Lake is one such place in the list which is an artificial lake fed by the back-flowing Yamuna River and Hindon River channel, settled amid the Sanjay Lake Park. The lake stretches its hands over 42 acres out of the total forest area of 170 acres. If we take a walk along the history of this tourist place in East Delhi, then we get to know that it was not until 1970 that the area was developed. With the coming of the year 1982, Sanjay Lake was opened for the public. The green surroundings of the lake are an instant crush for travellers looking for peace and for 90 species of birds and migratory ones. Moreover, there is a fitness track made especially for the people living nearby who want to walk and jog in a tranquil environment. An adventure park is also a part of the area since 16 December 2015 and has a jungle house, soft play area, archery, adventure bowling, tree top course, boating facility and more. To reach Sanjay Lake travellers have to deboard metro at Mayur Vihar Phase 1. The metro station falls on the Blue Line of Delhi Metro and is located 3.1km away from the lake.